Microsoft advises home computer users to take the smaller Windows Update version as the Full Install version (with 5 Language package) is a whopping 434.5 MB. That's the version typically used by System Administrators. On Dial-up it would have taken me 17 hours and 40 minutes to download at 56K. Therefore I elected to go with the Windows Update version, which utilizes an efficient transfer mechanism to download only the actual bytes changed. This is said to result in an approximately 65MB download. I had taken all of the Windows Updates to Vista during the past year. This made me hope that my actual download would be somewhat smaller than advertised since I am on Dial-Up. So two days after SP1's release I brought up Windows Update, crossed my fingers, and clicked the link to download and install SP1. The actual download (on Dial-Up) took 4 hours and 12 minutes but it was not without it's share of excitement. First Windows Update tells me that I'm downloading 66.9MB. I get 7% down and the download stopped. 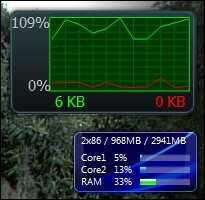 I know this because I have a Network Utilization Gadget on my Vista Sidebar that draws neat red and green lines on a graph, red for uploads and green for downloads. The green line had dropped to zero. Meanwhile my hard drive activity is going wild. Of course Microsoft does not give you a clue as to what is actually happening. I think it might have been scanning my hard drive to see what previous Vista updates I had installed as the download percentage kept moving up with no download activity shown on the Network Utilization graph. When the download percentage got to 46% the Network Utilization graph showed the actual download started again. A minute later I got a "Failed Update" error with an error code. There was a "Get Help" link so I clicked it and it gave me 24 Windows Update error codes. Guess what? Not one of the error codes was the one I had. All of a sudden I got that "sinking" feeling that things are not going well. What's a person to do? I have an error with no clue as to why it happened or what it is. I then noticed another link that said "Try Again." Since that was the only choice I had left I clicked it hoping I would not start the complete 66.9MB download all over again as I was already 40 minutes into the download. The actual download starts again as evidenced by my Network Utilization graph and it still says 46% complete. Wow, that's a relief! But what's this? Windows Update now claims my download is 69.2MB rather than the original 66.9MB. Again, not a clue as to why the file size has changed. All is well until I get to 57% complete, 1 hour and 36 minutes into the download. Up pops another error code. This time I'm lucky. This error is one of the 24 listed codes. It says I'm not connected to the Internet. Sure enough my connection was somehow dropped. I reconnect to the Internet and all goes well until I get to 90% complete. The Network Utilization graph shows the download has stopped and my hard drive is again going wild with activity. Before I know it the percentage complete runs to 100%. Next I see the Windows Update screen saying "preparing to install, creating a restore point, installing." Another screen pops up saying "Welcome to Vista SP1. What you should know before installing SP1." I really am not sure "exactly" what is going on. My hard drive is cranking away like crazy and I have one screen saying I should know something before installing and another indicating I am installing. Has the actual install started or not? It was my understanding before I started this download that one had to give permission for the actual install to begin. I thought maybe I could just download the SP1 package, save it on my hard drive, and install at my convenience. That is apparently not what Microsoft had in mind. And what is it my hard drive is working so hard at? Perhaps all of the hard drive activity was just extracting files from the download. I sure wish the guys that write this code would make things clearer. Anyway, I click thru accepting the License Agreement and get to an "Install" button. Along the way I am told to close all open programs, the install may take up to an hour, my computer might restart several times, and I cannot use my computer during the install process. So I close all open programs (except I forgot AVG Anti-Virus) and also get off the Internet. All this time my hard drive is still very active (doing what I don't know). I click the "Install" button, the hard drive is still cranking away and 8 minutes later I'm told the update has been successfully installed, however to finish the install, I must click "Restart Now." After clicking "Restart Now" I'm going through "Installing Service Pack "stage 1 of 3 and then stage 2 of 3 with a percent complete listing. Of course Microsoft again provides no information as to exactly what is taking place. At one point durning stage one I held at 65% complete for almost 4 minutes. I was starting to wonder if the install was hung up with my hard drive in a loop. When stage two reached 100% my computer auto shutdown and rebooted. On bootup I was into stage 3 of 3 with the percent complete running. It took a long 13 minutes before I was at my Desktop with the hard drive quiet. Along the way there were a few black screens, one with only the mouse cursor arrow. Best I can tell the actual install took around 35 minutes. So far after almost 4 weeks with SP1 installed all seems well. All programs I have tried work normally. Luckily I did not have any of the hardware/software drivers that do not work with SP1. Microsoft has blocked people with those problem drivers from downloading SP1 on Windows Update.